This is a very common air conditioning ‘symptom’ but the solution for this symptom isn’t always the same for every air conditioner that suffers from this kind of symptom or deficiency if you will. To understand this better you have to realize the function of what an air conditioner does. Whoa, hold the phone! No such thing as cold, you’re kidding right? No. There is only heat and the absence of heat is cold, but the proper term would be less heat. There is heat to some degree in air down to -459.67 degrees Fahrenheit. This is defined as Absolute Zero. The point in which there is no heat or if you prefer: the lowest temperature that is theoretically possible, at which the motion of particles that constitutes heat would be minimal. How this relates to your air conditioner is that if there is too much heat your AC system will run and run and run, because the thermostat is what cycles your air conditioner off. You may get some cooling from your AC system, but the air coming from the vents may not seem that cool during the heat of the day. 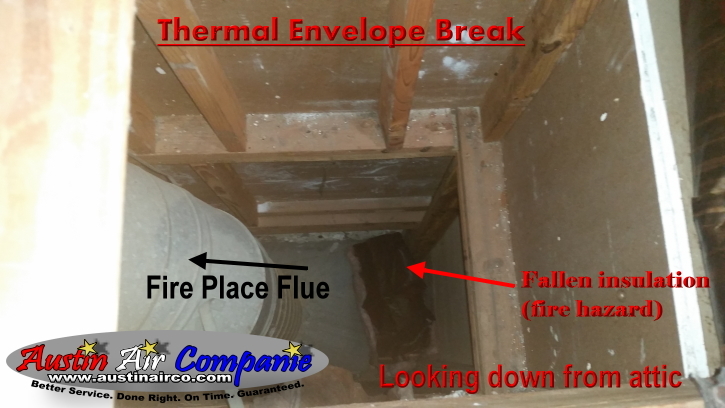 This could be due to mechanical means as much as dirt clogging things up or thermal breaks in your hot attic that are contributing to causing your air conditioner to struggle to removing the heat from your home. In some cases your AC system may be at fault, while other times it may be something else. In our climate of Katy, Texas (a west Houston suburb) our residential HVAC system design parameters for air conditioning is 95 degree outdoor and 75 degree indoor. People move to this climate every year and are often accustomed to lower indoor temps, this can also influence a lot of these kinds of problems because just setting the dial to a number doesn’t necessarily mean your system will be able to achieve ‘the number’ under all HVAC load conditions. 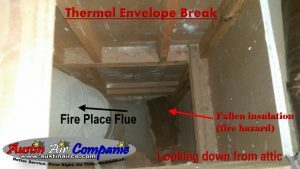 This is really best explained within the home after the AC system has been inspected for potential trouble spots. You see, your AC system operates by removing heat (commonly referred to as a load or heating load) from inside your home and expelling this heat outside your home. If your AC is running normal, you should feel warm air coming from the top of the outdoor condenser unit that sits outside your home. That warm air is from your home. 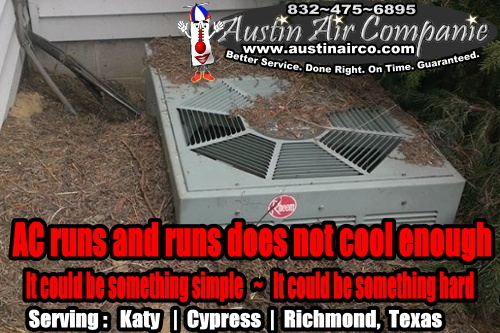 If your AC condenser is really hot, this is typically not a good condition and should be checked. An AC system is only as good as its greatest weakness. I can only check to see what the weakness of your AC system might be in person. Typically if an AC is not cooling properly it is generally a capacity type issue of some kind. These issues vary and is yet only another reason why the HVAC system must be inspected in person. There are a myriad of reasons an air conditioner displays these kinds of symptoms. Dirty filters, Improper filtration (restriction), thermal envelope breaks, lack of ‘proper’ maintenance, lack of ‘proper’ repairs, mechanical problems , dirty coils, improperly sized (duct work, equipment), improperly designed (using zoning improperly, duct system problems etc. ), improper refrigerant charge (either low charge or too much) and the list goes on and on. Then your AC system should be checked and diagnosed by a HVAC ‘licensed’ pro in person. Usually this can be accomplished by an AC systems check or as part of an annual maintenance visit. My company doesn’t use technicians. I am a Texas licensed HVAC contractor TACLB28416E with 23 years experience as of 2018. I will personally come to your home to diagnose your system. The kinds of problems mentioned within this Katy, Texas Air Conditioning article can effect any AC system of any age or brand. This is why an annual HVAC maintenance plan is recommended by all HVAC manufacturers. Problems like these don’t always mean the system ‘has’ to be replaced to fix these kinds of problems. But this is rarely a one size fits all kind of problem. Sometimes the system can be repaired and in some cases it may require partial replacement and there are other cases in which it is better to replace the whole system because the condition of the equipment is such that it’s not worth the risk to repair only to have it break down again / or there is some AC system design problem that can’t be repaired any other way. I often give multiple options to repair and or replace. On rare occasions it can be my opinion that only replacement is the best option. Realize this is 23 years of experience talking. My goal is always to fix the problem the best way possible and move on, sometime those options are extremely limited. It serves no purpose to repair your AC system only to have a slew of additional problems. I lean on my 23 years of experience in dealing with these kinds of issues. It’s completely up to you if you wish to trust that judgment or not. If you haven’t heard of this R22 refrigerant ban by now you’re in for a treat. Well, not really. This little fact only complicates and confuses an otherwise already challenging Air Conditioning repair market. In some cases, AC systems that use R22 Freon as the refrigerant of the system in question may make repair options much more costly now and even more so in the future. Currently it is best to have these kinds of discussions in person with me, as not all situations are created equal, and time can and does change various things like costs and in some cases new emerging technology. I can come up with a plan to deal with this effectively to transition your home away from relying on R22 Freon (refrigerant) to cool your home. However, there isn’t some magical process that doesn’t include replacing equipment, so you have to be ‘realistic’. The R22 production ban takes effect Dec. 31, 2019. While I expect to be able to still buy R22 refrigerant after this date the cost will most likely be much higher than it is today (2018). Because of the climate in which I do business. (Hot & Humid, up to 10 months of the year) I do not endorse or use alternative refrigerants that reduce capacity / increase utility costs / higher likelihood of compressor damage and so on for the High Temperature application for which R22 and R410a refrigerants were designed for. If your system was designed for R22, that is the type of refrigerant I use. I do not reuse old refrigerant, I reclaim it and return it to refrigerant reclaim center. All refrigerant placed in your AC system is the proper type of virgin quality refrigerant that your AC system needs. Reused refrigerant could be contaminated by acids. These acids form naturally in an AC system that runs ‘hot’. If I pull refrigerant from someone else’s system that is contaminated place it in my reclaim tank, that tank is now contaminated. Refrigerant that is acidic will eat the windings of your poor old compressor. The repair (if any) will be short lived. In some cases the damage may already have been done to some extent before I even arrive on the scene. Do you live in or near Katy, Texas | Cypress, Texas | Richmond, Texas? 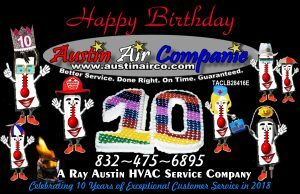 If you do you can call me personally at 832~475~6895 (My name is Ray Austin) and schedule your AC system check up and maybe set your systems up on a better preventive maintenance cycle and cover your systems on my twice a year maintenance contracts. That way I will remind you when it’s time to get your HVAC system(s) checked. I will help you stay on top of these AC maintenance issues that pop up from time to time to limit these kinds of problems from appearing in the first place.